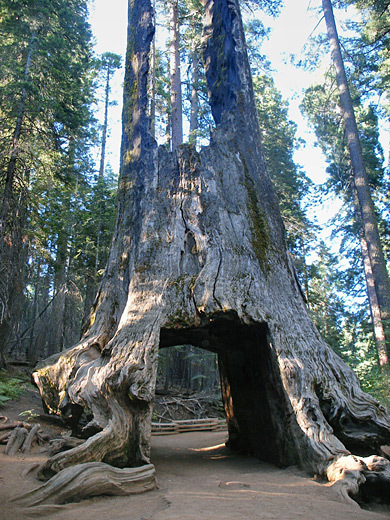 There are several drive-through trees in the redwood and sequoia forests of northern California, in various stages of preservation, such as the Pioneer Cabin Tree at Calaveras Big Trees State Park and Tunnel Log in Sequoia National Park. 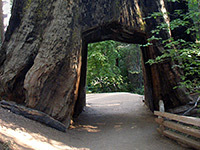 Yosemite National Park has two - the California Tunnel Tree in the Mariposa Grove and another tunnel tree in the smaller Tuolumne Grove, close to the Tioga Road near the west edge of the park. Tuolumne is one of just three sequoia groves in Yosemite, the others being Merced a couple of miles west and Mariposa near the southern park entrance, and it contains about two dozen mature trees, reached by an easy 1.1 mile hike along the Old Big Flat Road, a narrow, paved route no longer open to vehicles. A short loop path passes through the base of the tunnel tree (now just a burnt stump, known as the Dead Giant) and continues past a few other giant sequoia both living and deceased; the round trip can take less than an hour, and although the place is quite often visited, the forest retains a sense of peace and stillness - much more so than the larger but much busier grove at Mariposa. 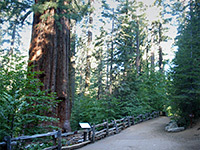 The Tuolumne Grove trailhead is beside a spacious carpark adjacent to an NPS maintenance compound along the south end of the former road, half a mile north of the junction with Big Oak Flat Road at Crane Flat. A noticeboard gives information about the hike, next to a cross-section of a huge sequoia trunk, now used as a bench. The narrow road (closed to all traffic since 1993) descends gradually through tall, thick pine/cedar forest, round a couple of bends then drops down more steeply - 400 feet in total - to the grove, entrance to which is marked by another notice. The short loop path branches off to the right, through the base of the tunnel tree then past a few surviving sequoia and other fallen, fire-damaged trunks, across a small stream and back to the old road. Several other mature sequoia grow on the far (west) side of the road, surrounded by dense undergrowth of bushes, dogwoods, ferns and smaller trees; the land hereabouts is cool and shady, on the west-facing slope of quite a narrow ravine, kept moist by a year round stream (North Crane Creek) that flows a little lower down through the valley. Past the Tuolumne Grove, the road continues downhill another 4 miles to one of the Yosemite National Park campsites at Hogdon Meadow, near the entrance station on CA 120.